As we collect more and more business data across multiple systems, that data gets more and more difficult to see and use in meaningful ways. Many organizations face this challenge, including HumanGood, which arose out of the merger of ABHOW and be.group, two nonprofit senior living providers. As the new vice president of marketing for HumanGood, Suzanne Nagel felt the challenge acutely. HumanGood was already working with SmartBug Media for website design and development in addition to growth-driven design (GDD) and conversion rate optimization, so Nagel looked to SmartBug to unify HubSpot data with metrics from Salesforce, Adwords, and Google Analytics. As part of our ongoing growth-driven design work, SmartBug needed to report on performance metrics for the HumanGood website, such as visits, and for deeper-funnel metrics, such as sales qualified leads (SQLs), appointments, and depositors. This data could be viewed in silos in each system, but there was no straightforward, unified view. Nagel needed dashboards to combine these metrics at a glance for the corporate site and for 18 individual communities, with accurate data that could be easily understood and presented throughout the organization. To solve this problem, SmartBug recommended the newly emerging HubSpot and Databox integration. Although HubSpot was an ideal tool for navigating website page performance in detail, Databox was an ideal way to force focus on core metrics, free from distractions. Within Databox, SmartBug was able to pull in HubSpot data, marry it with per-community Google Analytics and Adwords data, and incorporate sales performance by incorporating Salesforce reports in dashboards. 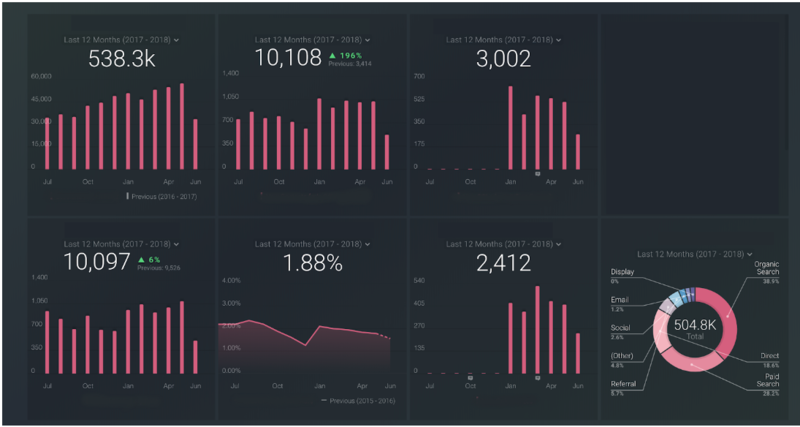 These dashboards set the scene for monthly performance across locations, helping SmartBug and HumanGood to collaborate and identify hotspots and opportunities for growth. These dashboards provide instant, cross-platform snapshots of sales and marketing performance, empowering HumanGood and SmartBug to make powerful recommendations and track progress toward goals.